Bruce Charles "Bill" Mollison (4 May 1928 – 24 September 2016) was an Australian researcher, author, scientist, teacher and biologist. He is referred to as the "father of permaculture. "[n 1] Permaculture (a portmanteau of "permanent agriculture") is an integrated system of ecological and environmental design which Mollison co-developed with David Holmgren, and which they together envisioned as a perennial and sustainable form of agriculture. In 1974, Mollison began his collaboration with Holmgren, and in 1978 they published their book Permaculture One, which introduced this design system to the general public. Mollison founded The Permaculture Institute in Tasmania, and created the education system to train others under the umbrella of permaculture. [n 2] This education system of "train the trainer", utilized through a formal Permaculture Design Course and Certification (PDC), has taught thousands of people throughout the world how to grow food and be sustainable using permaculture design principles. In 1981 he was awarded with the Right Livelihood Award (also known as "Alternative Nobelprize") for his accomplishments in the field of permaculture. Bruce Charles "Bill" Mollison was born in 1928, in the Bass Strait fishing village of Stanley located on the north-west part of Tasmania, Australia. He moved from Tasmania to Tyalgum in the Tweed Valley of northern New South Wales in 1987 where he lived for the next decade before returning to Tasmania. He spent his final years in Sisters Beach in north-west Tasmania. He died in Hobart, Tasmania, in 2016, aged 88. He is survived by his fifth wife Lisa, four daughters, and two sons. Mollison left school at age 15 to help run the family bakery. In the following ten years he worked as a shark fisherman, seaman, forester, mill worker, trapper, snarer, tractor-driver and naturalist. In 1954, at the age of 26, Mollison joined and worked for the 'Wildlife Survey Section' of the Commonwealth Scientific and Industrial Research Organisation (CSIRO). In the 1960s, he worked as a curator at the Tasmanian Museum. He also worked with the Inland Fisheries Commission, where he was able to resume his field work. In 1966, he entered the University of Tasmania. After he received his degree in bio-geography, he stayed on to lecture and teach, and developed the unit of Environmental Psychology. He retired from teaching in 1979. After many years as a scientist with the CSIRO Wildlife Survey Section and with the Tasmanian Inland Fisheries Department, I began to protest against the political and industrial systems I saw were killing us and the world around us. But I soon decided that it was no good persisting with opposition that in the end achieved nothing. I withdrew from society for two years; I did not want to oppose anything ever again and waste time. I wanted to come back only with something very positive, something that would allow us all to exist without the wholesale collapse of biological systems. In 1974, he and his University of Tasmania student David Holmgren "jointly evolved a framework for a sustainable agricultural system based on a multi-crop of perennial trees, shrubs, herbs (vegetables and weeds), fungi, and root systems" for which they coined the word "permaculture". As I saw permaculture in the 1970s, it was a beneficial assembly of plants and animals in relation to human settlements, mostly aimed towards household and community self-reliance, and perhaps as a "commercial endeavor" only arising from a surplus from that system. However, permaculture has come to mean more than just food-sufficiency in the household. Self-reliance in food is meaningless unless people have access to land, information, and financial resources. So in recent years it has come to encompass appropriate legal and financial strategies, including strategies for land access, business structures, and regional self-financing. This way it is a whole human system. He helped found the first Permaculture Institute, established in 1979 to "teach the practical design of sustainable soil, water, plant, and legal and economic systems to students worldwide." In 1981, the first graduates of the permaculture design course (PDC) that he had helped to initiate, started to design permaculture systems in their respective communities. In this way, the philosophy of permaculture had begun to move beyond its original context in "land management" to cover most, if not all, aspects of human life. In 1987, Mollison taught the first PDC course that was offered in India. By 2011 there had been over 300,000 such graduates practicing and teaching throughout the world. Permaculture – A Designer's Manual (1988) ISBN 978-0-908228-01-0: has been used extensively as the text book and curriculum for the 72-hour Certificate course in Permaculture Design. Introduction to Permaculture, with Reny Mia Slay. (Tasmania, Australia: Tagari Publications, 1991; revised 1997; 2nd ed. 2011) ISBN 978-0-908228-08-9: in this book recognized that his original idea for permaculture had evolved, and a movement had grown, that could "spread to cover all human habitats; and the word was redefined as not just permanent agriculture, but also permanent culture." Mollison, Bill (15–21 September 1978). "The One-Straw Revolution by Masanobu Fukuoka – book review". Nation Review. p. 18. ^ Although Joseph Russell Smith is not similarly referred to as the "father" of permaculture, some have offered the disclaimer that Smith, and not Mollison/Holmgren, was the first to write about a system of permanent agriculture in a book entitled Tree Crops, published in 1929, and earlier in 1910, in a book entitled Breeding and Use of Tree Crops. Others would argue, however, that such a disclaimer is based on a common misunderstanding of permaculture as a specific style of agriculture or gardening, rather than an ecologically-inspired design system. A food forest certainly can be one outcome of a permaculture design process, but so can an organic backyard garden. From the Wikipedia article on permaculture: "a system of agricultural and social design principles centered on simulating or directly utilizing the patterns and features observed in natural ecosystems." ^ I.e., many of the more prominent teachers are listed in the "See also" section of this article, but includes many others without Wikipedia articles such as April Sampson-Kelly who created the first on-line system called, Permaculturevisions Online Institute in 1993, via permaculturevisions.com. ^ a b Mercury staff-writer (26 September 2016). "Bill Mollison, co-founder of global permaculture movement, dies in Hobart". The Mercury. Retrieved 29 September 2016. ^ "The Companion to Tasmanian History". University of Tasmania, Australia; Library. Retrieved 1 January 2013. ^ a b Tortorello, Michael (27 July 2011) "The Permaculture Movement Grows From Underground". The New York Times. ^ a b c Francis, Robyn (30 September 2016). "Bill Mollison – a giant tree has fallen in the forest of humanity". Permaculture College of Australia - Djangbung Gardens. ^ Felix, Luis (26 September 2016). "Permaculture-design leader Bill Mollison dies". Echo Netdaily. Retrieved 29 September 2016. ^ a b O'Connor, Ted (26 September 2016) "'You started a quiet revolution': Tributes flow for permaculture 'father' Bill Mollison". Australian Broadcasting Corporation. ^ ""With deep sorrow, we wish to inform family and friends that Bruce Charles "Bill" Mollison, the "Father of Permaculture," has passed away."". The Permaculture Research Institute. 25 September 2016. Retrieved 30 September 2016. ^ Dunwell, Matt (10 October 2016). 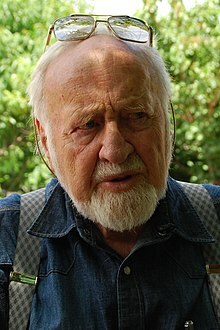 "Bill Mollison obituary: Ecologist and one of the co-creators of permaculture". The Guardian. Guardian News & Media Ltd. Retrieved 12 October 2016. ^ a b c Bell. Graham (26 September 2016). "Bill Mollison Obituary" (PDF). grahambell.org. Retrieved 29 September 2016. ^ a b Hemenway, Toby (2009). Gaia's Garden: A Guide to Home-Scale Permaculture (2nd ed.). Chelsea Green Publishing. p. 5. ISBN 978-1603580298. ^ a b Raver, Anne (13 February 2013) "Their Trip to Bountiful". The New York Times. ^ Hodgson, Martin (18 July 2006). "The permaculture club". The Guardian. Retrieved 29 September 2016. ^ "Worldwide Permaculture Projects A growing list of permaculture projects worldwide". Permaculture Research Institute. 2016. Retrieved 29 September 2016. ^ Gilley, Dermot (26 September 2014). "Geoff Lawton presents: Permaculture - A Designers' Manual (Podcast)". Permaculture: 50-minute Australian-made documentary from 1989 – see also Timestamped study notes for this video. In Grave Danger of Falling Food: Another 50-minute Australian-made documentary from 1989. The Global Gardener Part 1 The tropics:. The Global Gardener Part 2 Dry Lands:.